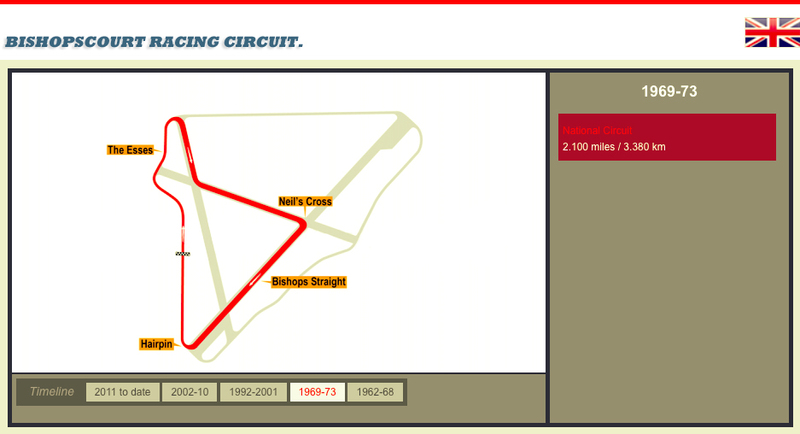 BISHOPSCOURT RACING CIRCUIT – A Short History. 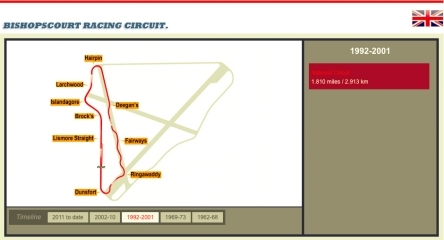 Like many of today’s motor racing circuits throughout the British Isles Bishopscourt Racing Circuit started life as a second world war airfield. The decision to build RAF Bishopscourt was made in November 1941. Although it would be the spring of 1943 before it became fully operational. The base was designed as a class A bomber airfield with a main runway of 2,000 yards and two subsidiaries of 1,400 yards. When the airfield opened on 1st April 1943 it was allocated to the RAF Flying Training Command. The Ulster Automobile Club (UAC) held the RAC Tourist Trophy Race of Ards from 128 to 1936 and then Dundrod from 1950 to 1955, however after three fatalities in 1955 the RAC decided that Dundrod was too dangerous and could not be used for motor racing again. 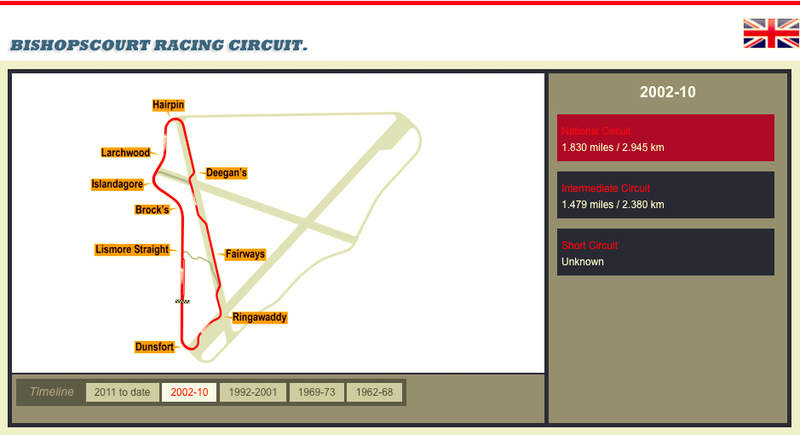 The TT moved back to England, but it didn’t take long for the UAC to get back into motor racing holding seven events at RAF Long Kesh from 1957 to 1960 and then a single meeting at Cluntoe Airfield Ardboe in 1961. 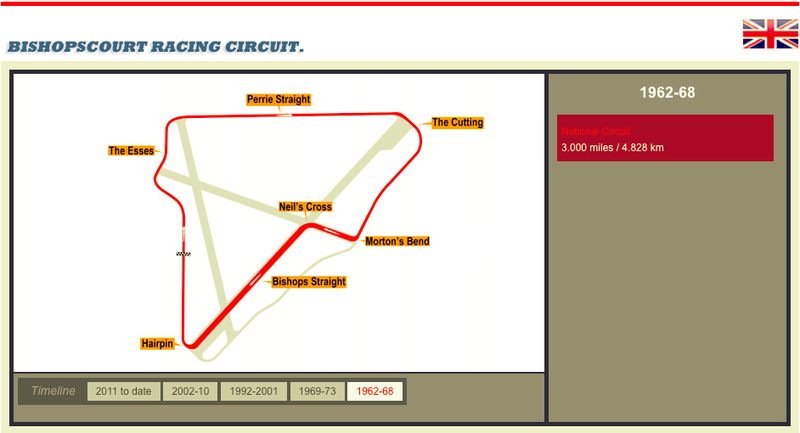 On Saturday 22nd September 1962 they held the first race meeting at Bishopscourt using a 3 mile long circuit. Hollywood racing car constructer John Crosslé was the first race winner for 1172cc side-valve Ford Specials whilst Malcolm Templeton(Lotus) won the Champion Trophy for Formula Junior cars from John Pollock (Gemini) who had the consolation of recording the fastest lap at 91.37mph. The UAC revived their famous Ulster Trophy race in 1963 and in September 1966 Tandragee’s Tommy Reid set the first 100mph lap at 100.75mph driving a 4.7 litre Crosslé-Selby Cobra Ford for Mick Mooney’s Irish Racing Cars team. The Leinster Motor Club held their Leinster Trophy meeting at Bishopscourt in July 1967 and the same club returned in May 2012 to hold the first regulated motor racing meeting of the current era some thirty nine tears since the UAC’s last race meeting in September 1973. The Mourne Club brought motorcycle racing to Bishopscourt for the first time in October 1968 when Steve Murray, Tommy Robb, Bill Smith and Brian Steenson were among the winners. The Temple Club celebrated their 50th Anniversary at Bishopscourt in April 1971 at which Barry Sheene won the 200cc race on his 125cc Suzuki and on Saturday 19th August 1972. Ulster Centre Promotions forced to cancel the Ulster Grand Prix due to the security situation in the province at that time held an international race meeting to mark the 50th anniversary of the Ulster Grand Prix at which Cheshires Stan Woods claimed a hat-rick of wins. 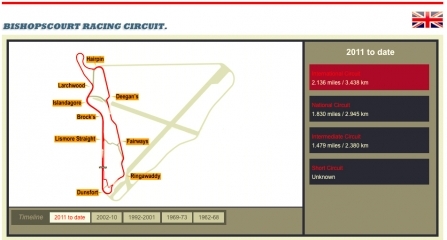 Late on 12th October 1973 the security authorities informed the UAC that they could not use the circuit following a bomb attack on the RAF installations at the airfield. The UAC’s 2½ hours relay race was scheduled for the 20th October was switched to Kirkistown. The airfield continued in operation as part of the UK Military Air Traffic Service until October 1978 during which time the base was known as Ulster Radar. From the late 1980’s it was used by No. 664 (Volunteer) Gliding School which was disbanded at the end of October 190 when the RAF finally withdrew. 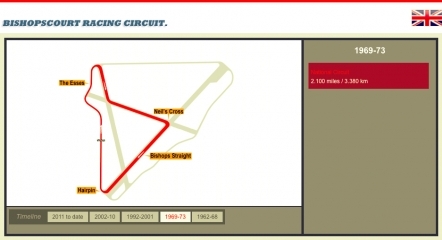 Davy and Barbara Beatie and John Griffin purchased a section of the airfield encompassing the 1968-1973 circuit and motorcycle racing returned to Bishopscourt with the Motorcycle Road Racing Club Of Ireland holding their season opening closed to club event on Saturday14th March 1992. The first race winner in this new era was Leslie McMaster on a 350 Yamaha. Alan Irwin won five races that day and is still the most successful car or motorcycle competitor in the history of the circuit with 29 wins from 1992 to 1995. Many motorcycle races have been held at Bishopscourt since 1972 including the Norman Brown Memorial meeting, the Enkalon Clubs 20th Anniversary meeting in 1996, the Enkalon Trophy since 2005 and in 1994 the Hilsborough Club brought the Sunflower Trophy meeting to the circuit for the first time. World Championship Supermoto racing was held in 2005 and the first Supermoto of Nations World Championship team event was held in 2001. Current owner Jim O’Brien purchased the circuit in 2001 after the after the activities of the previous owners were halted in August 2001 when the bank foreclosed on loans following a long running planning dispute. A fun day car race was held in December but it was 2002 before the circuit was back in operation and a slightly revised circuit layout was introduced in September of that year in time for the Sunflower Trophy races. 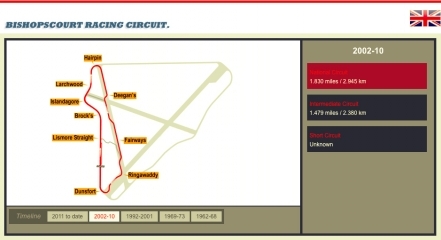 Since then Jim has overseen a major investment programme in the circuit which has included full resurfacing and new circuit layout introduced in 2011, along with new toilet and shower blocks, a scrutineering bay, stores and race control tower. Ian Lowery held the motorcycle lap record for the 1.824 miles national circuit setting a speed of 99.006mph in 2010 until Christian Iddon topped the 100mph mark on his Tyco BMW at the Sunflower Trophy Races in 2016 with a lap speed of 100.676mph, but it was kart driver Chris Needham from Cheshire who was first to break the 100mph barrier with a best lap of 101.63mph driving an Anderson/FPE during the UK Superkart meeting on Saturday 2nd June 2112. The outright track record was further reduced on Saturday 31st May 2014 when Liam Morley from Lancashire took his 250 Anderson DEA Superkart round at a speed of 103.266mph.